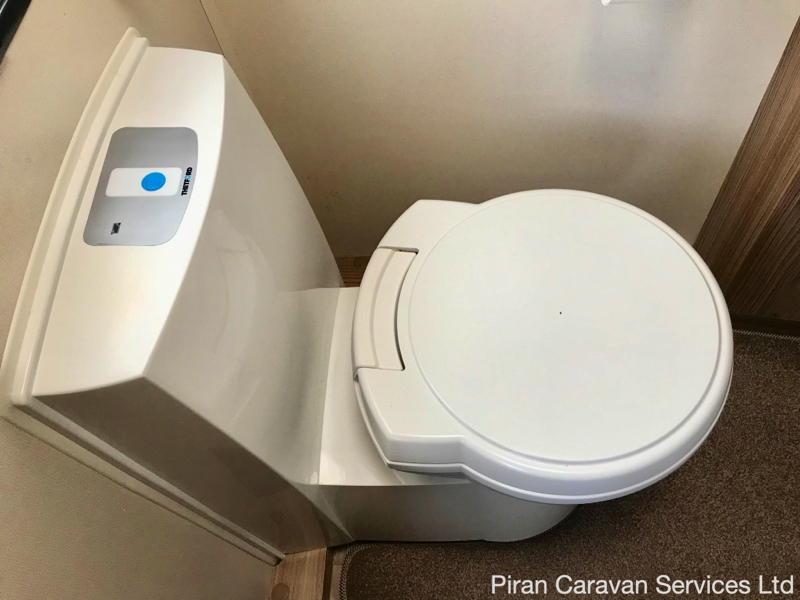 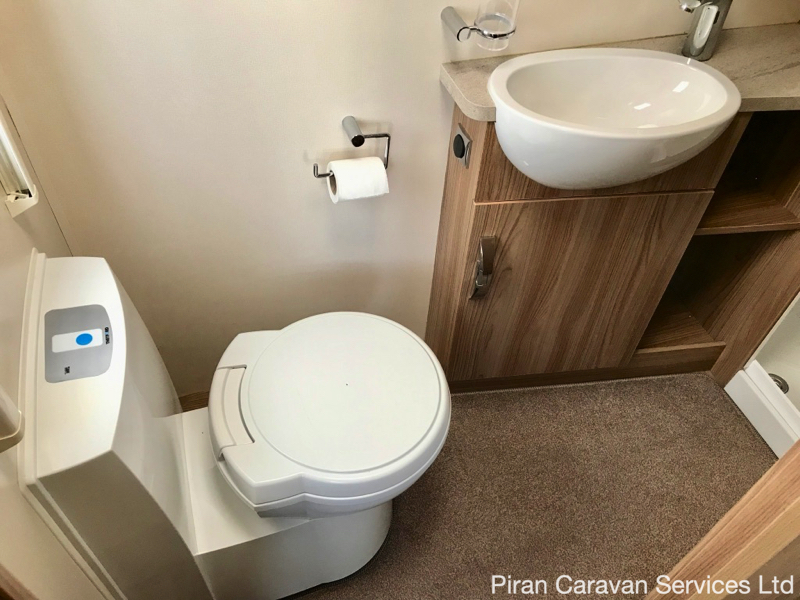 If you are looking for a modern, 4 berth touring caravan with a transverse fixed bed and end washroom layout, which doesn't compromise on space or flexibility, with motor mover, awning and extras included, this caravan will meet your requirements! 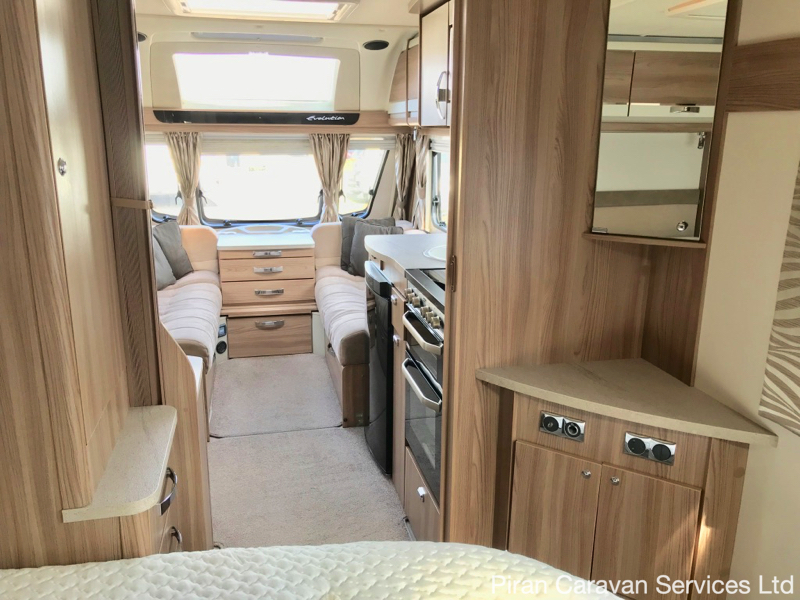 This stunning 2015 Swift Evolution 584 can confidently be described as being in excellent condition, having been purchased when new from Highbridge Caravans. 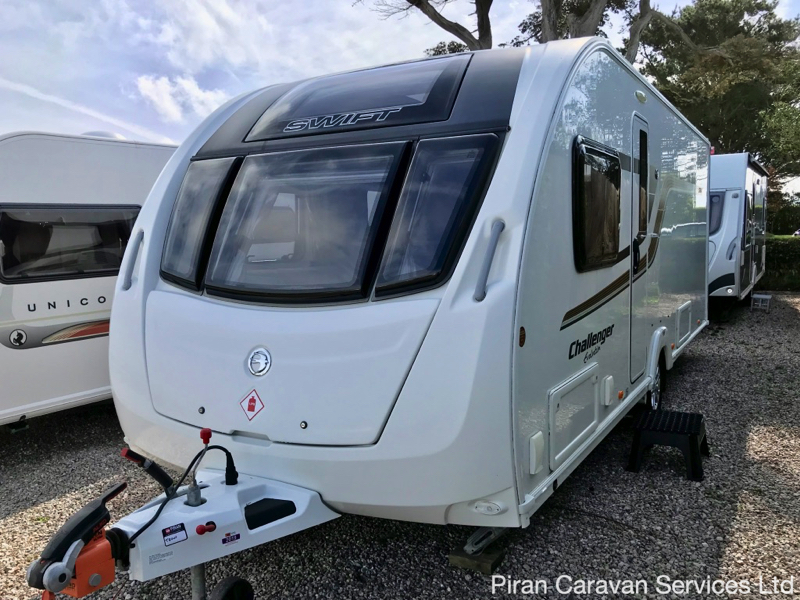 Offering fantastic value for money, this Swift Evolution also comes with an 2018 model Dorema Porch awning in grey and blue, with groundsheet. 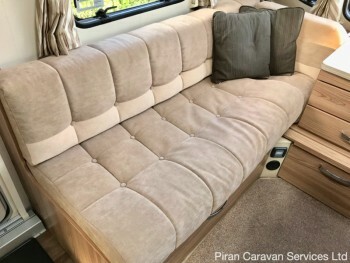 It has also been fitted with a remote control motor mover, making siting this caravan on a pitch or driveway a breeze. 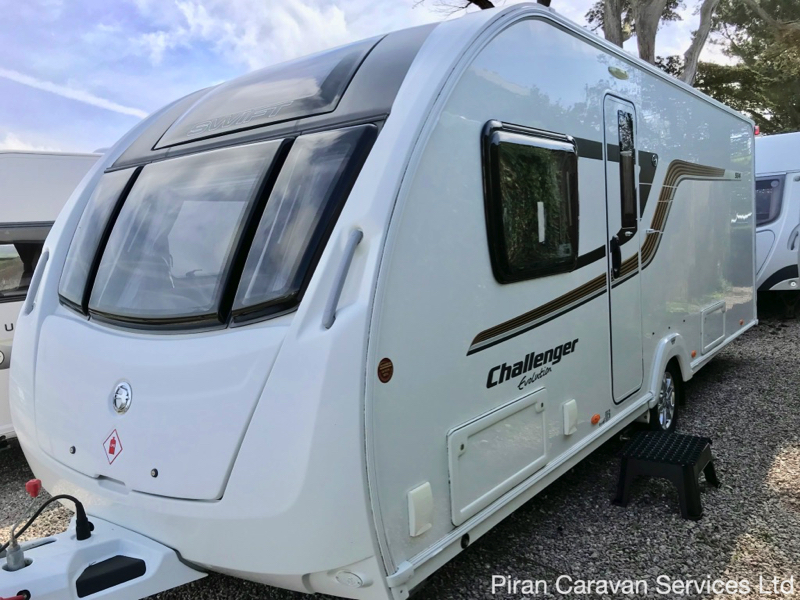 Also included in the sale are an Aquaroll and Wastemaster, Full Stop hitch-lock and Al-Ko wheel-clamp as well as towing mirrors, a caravan step and other accessories. 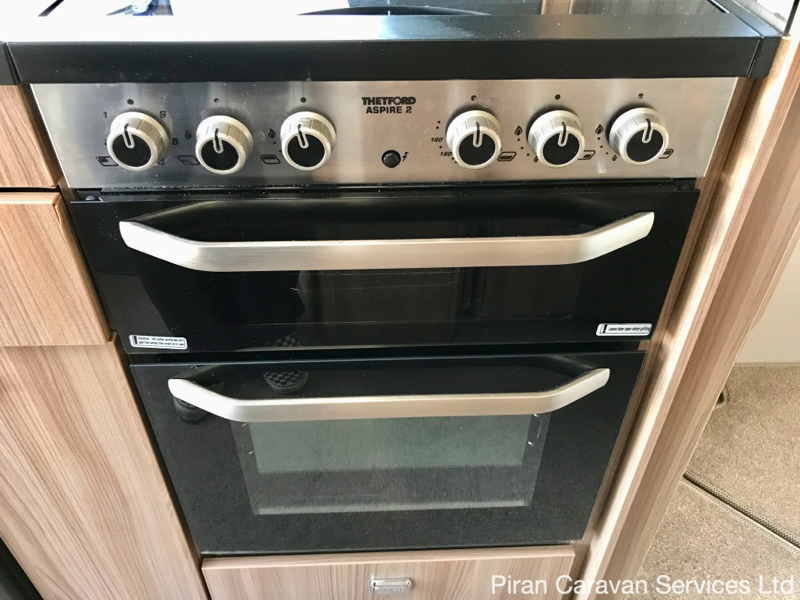 It will be fully serviced and damp-checked prior to sale and all the owners manuals, paperwork and documentation are present. 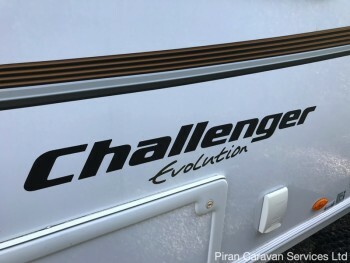 The Swift Challenger Evolution 584 will be suitable for a couple looking for a spacious fixed bed layout which can be accesssed from both sides of the bed, as well as families with children who can use the lounge at night time. 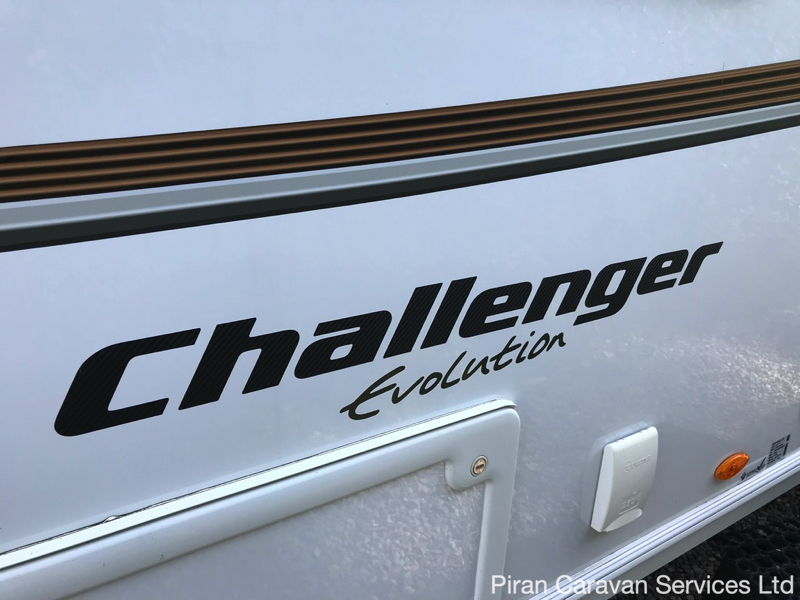 Swift Evolution 584 is a special edition caravan made for Highbridge by the Explorer group and is based on the Swift Challenger 580-4 but with upgraded furnishings and trim, to bring it up to a higher specification for discerning Highbridge customers. The Explorer has an identity all its own and the features which distinguish it from standard Challengers include a key fob alarm, additional exterior locker access, automatic gas changeover system, solar panel, kitchen extractor fan, dimmable spot lights and additional interior kitchen and washroom lighting. 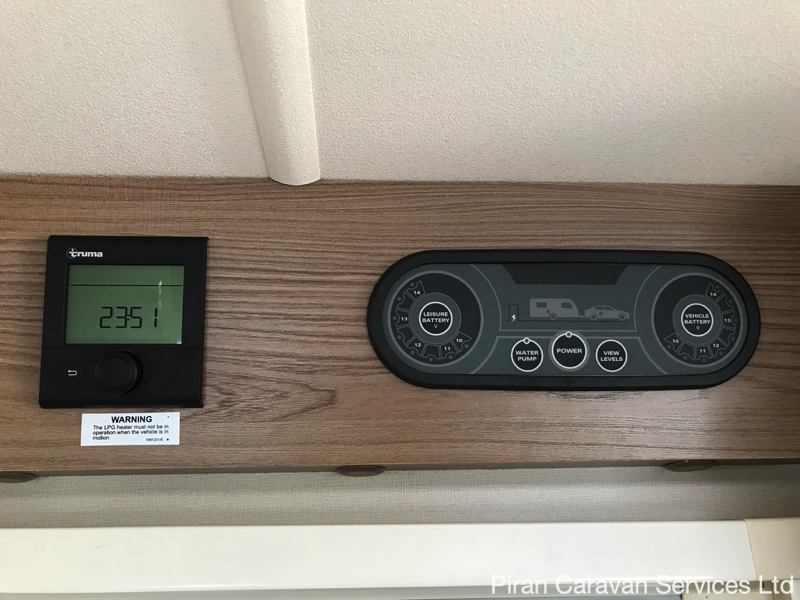 Manufactured using enhanced SMART Plus construction, the Swift Swift Evolution 584 shares all the same engineering as its siblings. 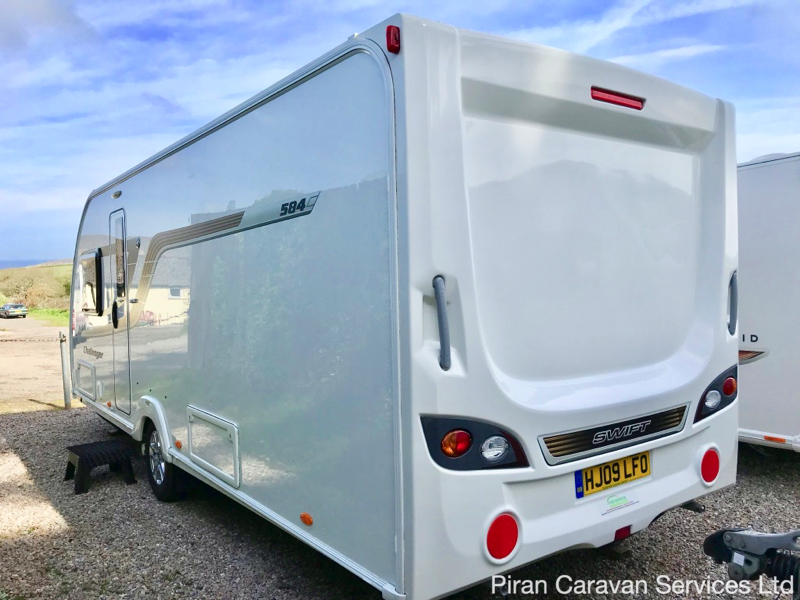 Using GRP sandwiched body panels, a strong moisture-proof polyurethane timber-less frame, full height GRP front and rear panels and and a fully bonded GRP roof, this Swift strikes the perfect balance between durability, practicality and weight. Built on an Al-Ko galvanised chassis, with alloy wheels and bright contrasting red and grey graphics, the Swift Challenger 584 has an attractive, modern appearance both on the road and when sited. 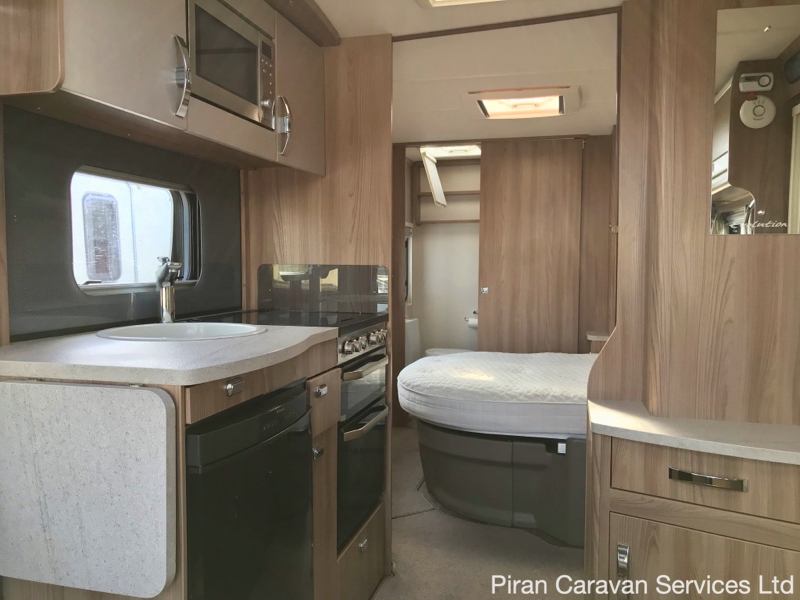 The Grade 3 thermal insulation in the walls, floor and roof ensures this is a caravan which really can be comfortably used year round. There is a spare wheel is stowed in the front locker, AL-KO 3004 stabiliser, and an external 240v socket. 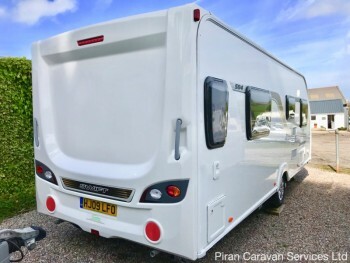 There is a 13 pin DIN standard socket to connect to the car towing electrics and an external BBQ point. 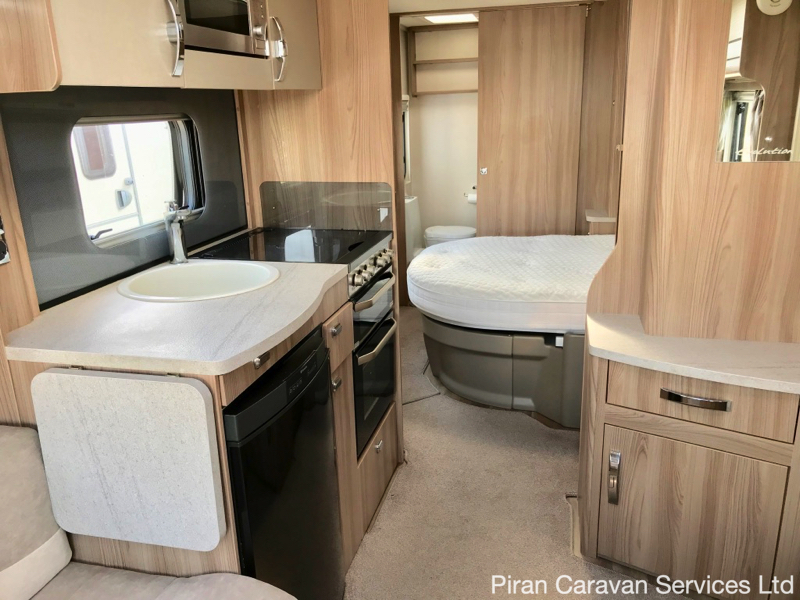 At the front of the caravan, 3 panoramic privacy windows, featuring fly screens and black-out blinds, and a vertical skylight panoramic window provide a fantastic view from the lounge which consists of 2 bench seats, of spaceframe construction. 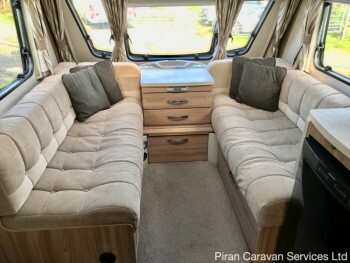 These seats convert into a double bed with the pull-out slat system. 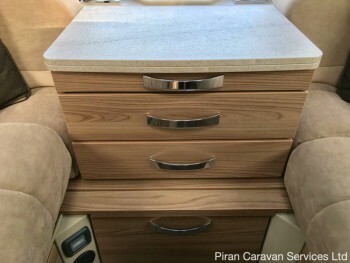 Storage is provided under the seats, in the centrally positioned chest of drawers and in the overhead aircraft-style lockers. 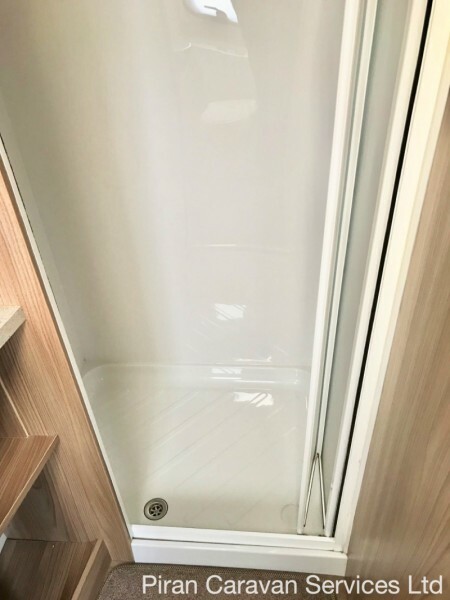 The SE models have two tone finished locker doors, with chrome and cream accents. There is a small table which pulls out from the top of the chest and a separate folding table is provided for family dining. 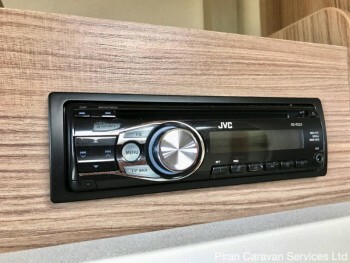 The interior design has been carefully co-ordinated with the 'Aralie Sen' wood grain, providing rich colouring and defined wood texture, throughout the furniture in the caravan. The quality upholstery features neutral tones, complemented by matching curtains, scatter cushions and drop-in carpets, resulting in a modern and attractive living space. A Heki 2 rooflight, provides ventilation and light into the living area. 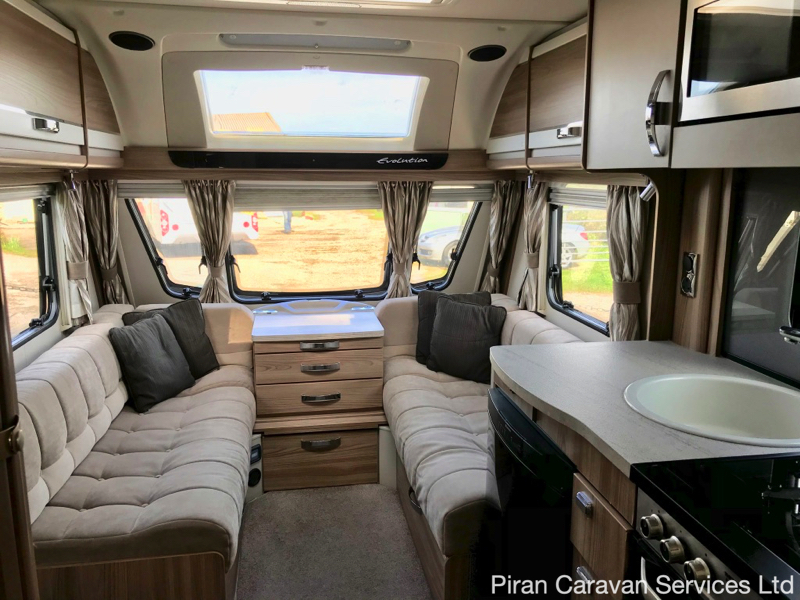 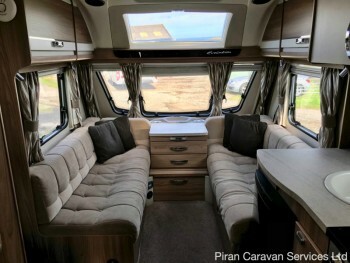 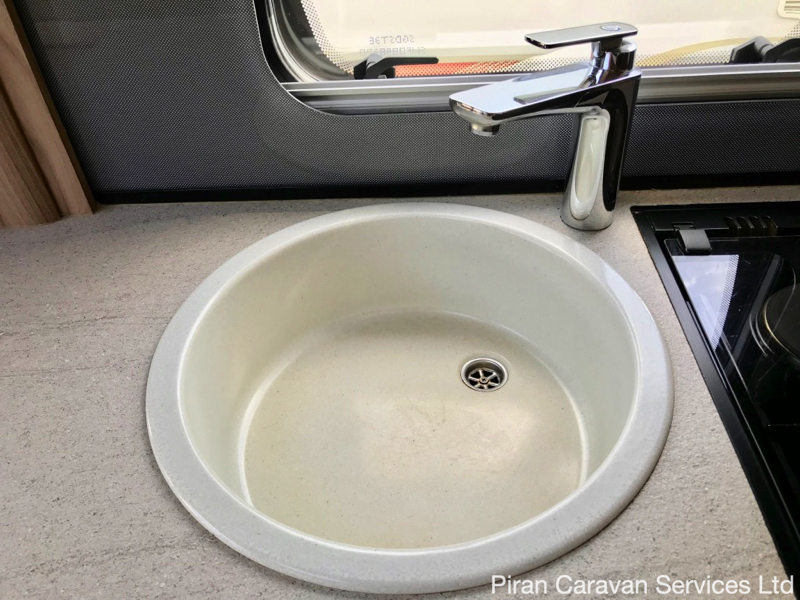 The caravan features energy-saving LED throughout, complimented by mains corner lights, LED downlighter, concealed over locker ambient lighting and LED spot-lights. 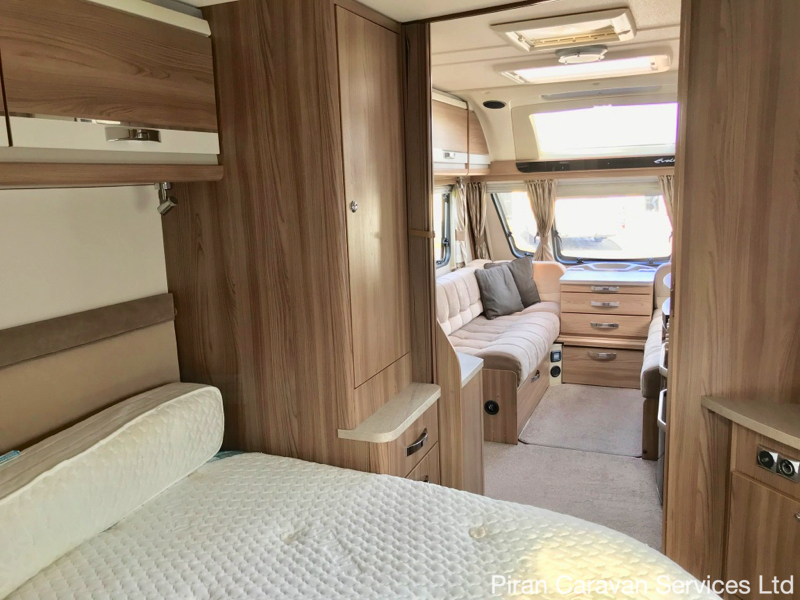 This gives the well-lit interior of the Swift Evolution 584 an impressive and classy feel, whilst also increasing battery time. 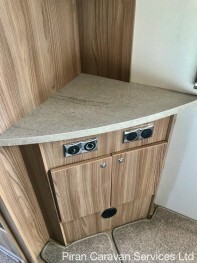 Moving back from the lounge, opposite the kitchen is a tv point and a useful wardrobe with a hanging rail. 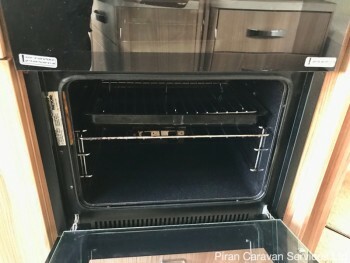 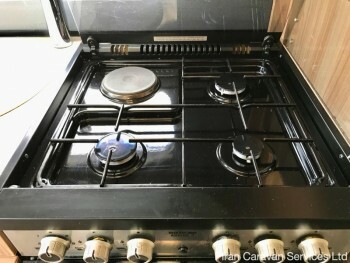 In the middle of the caravan, the well-appointed kitchen has a Thetford dual fuel hob and a separate thermostatic grill and oven. 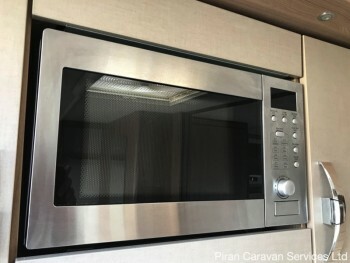 The kitchen also features a built-in ventilated microwave oven and a Dometic 3-way fridge with a full width ice box, curved door, electronic ignition and digital controls for energy selection and temperature. 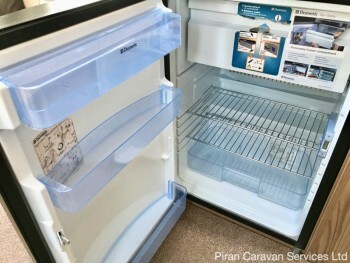 There is plenty of food/cooking utensil storage space, including a slide out storage rack. 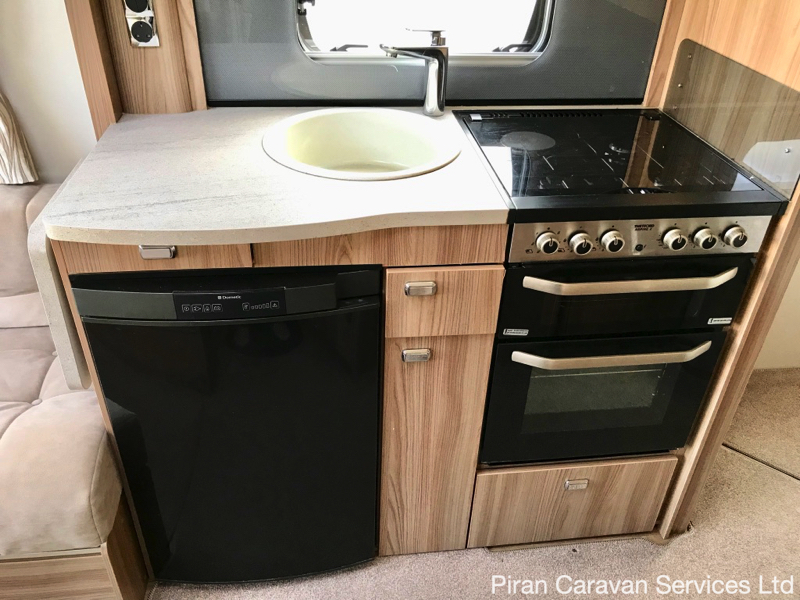 There is a granite effect kitchen sink with integrated occasional drainer and removable extension ample worktops with down lighting, chrome finish brass mixer tap and above the cooking area is a small roof-light. 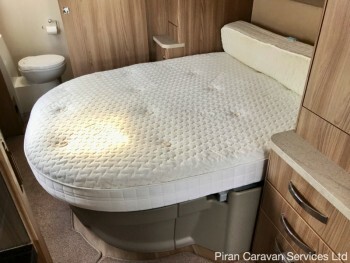 Further aft in the Swift Evolution 584 is the highlight of this layout, the transverse mounted fixed island bed, on a lightweight space frame, which lifts up on gas struts to provide access to the large storage area underneath, and is fitted with 'Duvalay Duvalite' luxury deep sprung bed mattress. 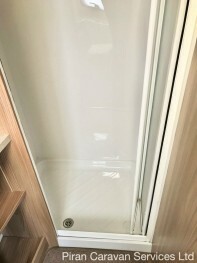 The bedroom can be separated from the rest of the caravan by a privacy screen and there are overhead lockers and storage either side of the bed, meaning the storage is flexible as well as large. 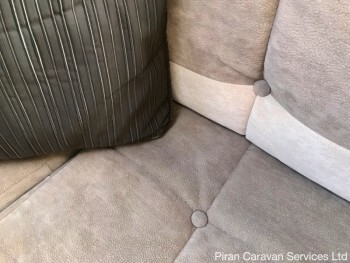 A nice touch is the cushioned headboard which is upholstered in the same fabric as found in the living area. There are 2 reading lights positioned over the bed, and a small Heki roof light. 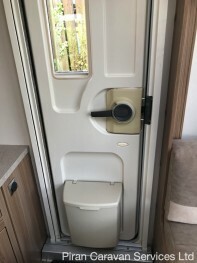 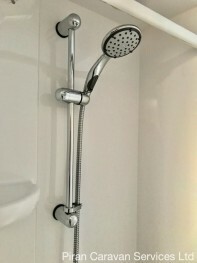 With this layout, which does not compromise on washroom facilities, the large end bathroom can be used as a changing area and features a spacious lined shower cubicle with a Ecocamel Orbit shower head and bi-fold door, a vanity unit with sink, mirror and cupboard and a Thetford c250 cassette toilet with electric flush. 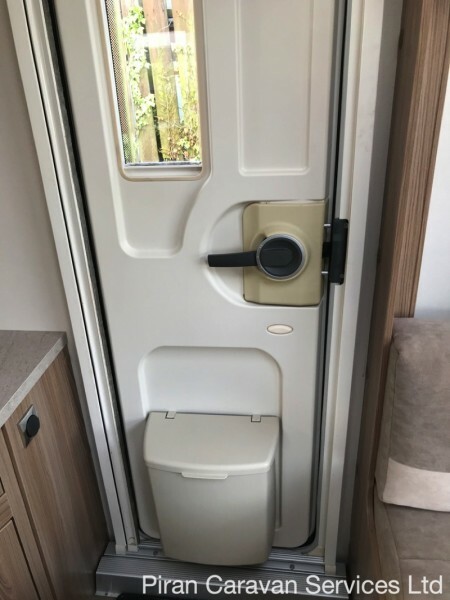 Blown air heating is ducted to the living, sleeping and bathroom areas, with additional heating provided by a Truma dual fuel 3kw gas and 2kw electric space heater with automatic ignition. 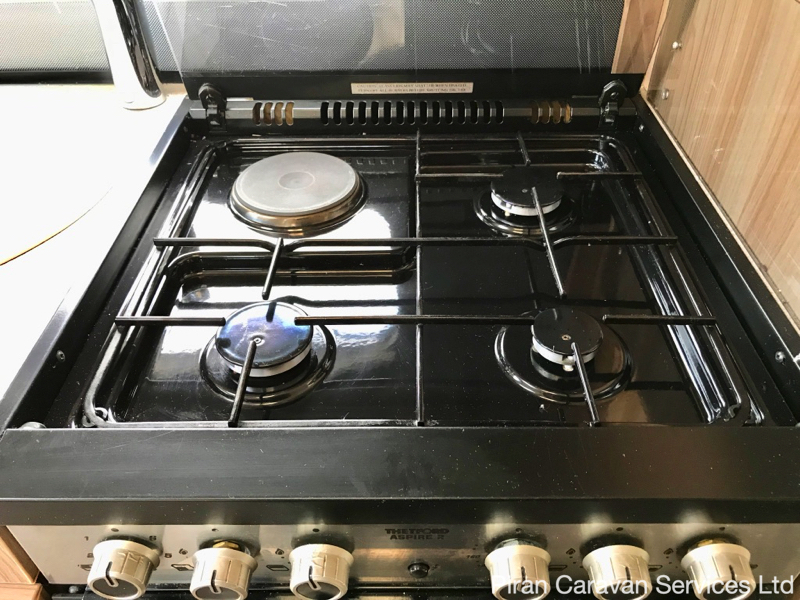 A Truma Combi dual fuel gas and 800w mains electric water heater provides hot water on demand for the kitchen and bathroom. 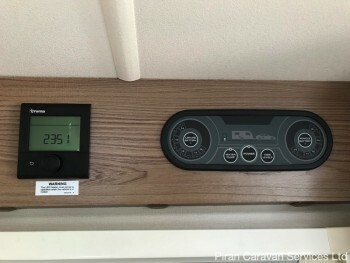 Additional equipment on this Swift Swift Evolution 584 includes an intelligent battery charger; smoke detector, inbuilt CD/Radio/MP3 player with iPod connectivity, 12v LCD 'Swift Comand' control panel with battery selection, battery state meter, clock, lighting, heating temperature and water pump controls. There are also two TV points with 230V, 12V and coax aerial sockets, as well as a roof-mounted directional and telescopic 530 Status aerial (digital compatible). 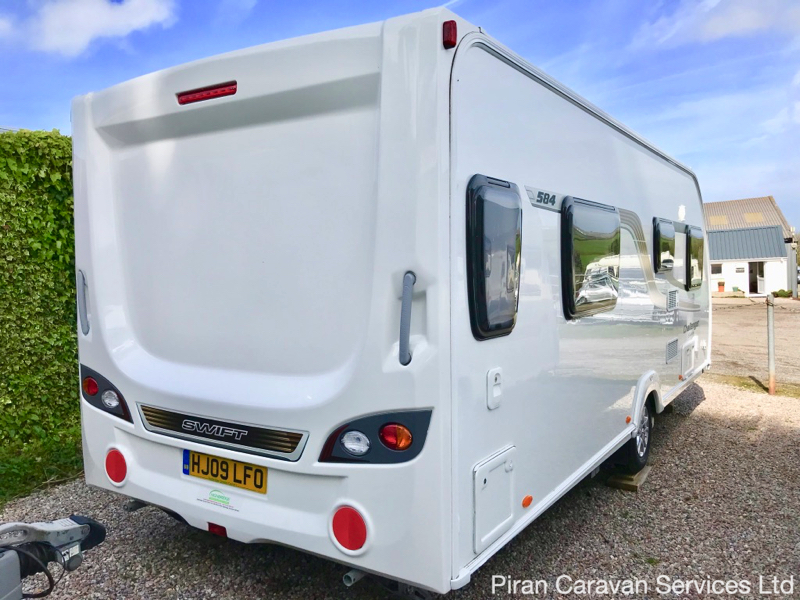 Included in the sale are a large number of essential caravanning extras, making this Swift Evolution 584 exceptional value for money, including a dealer-fitted E-Move Remote control motor mover maing this caravan a piece of cake to site on tricky pitches or tight driveways. As previosuly mentioned, the sale also a Dorema porch awning, Aquaroll, Wastemaster, hook up cable and more. 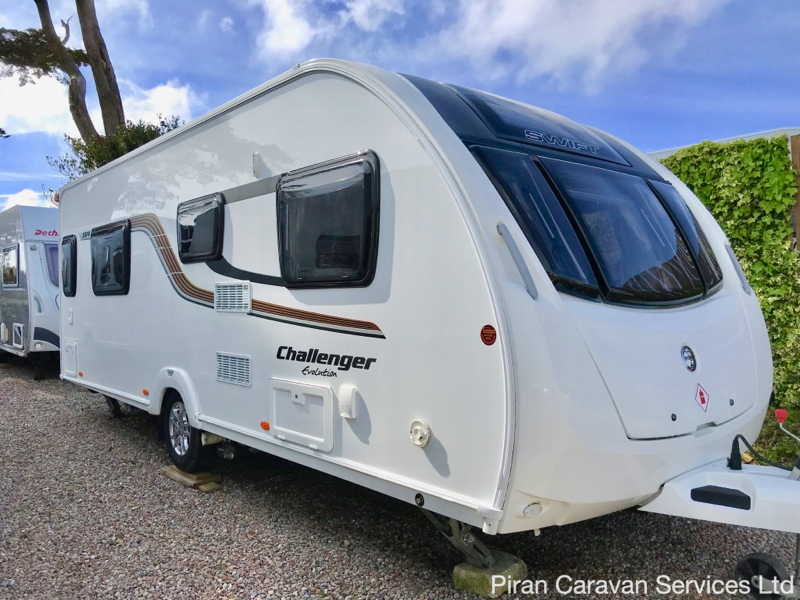 Offered for sale in lovely condition, this is an excellent dealer 'special edition' example of Swift's popular Challenger 580-4, and the transverse island bed layout is highly desirable. 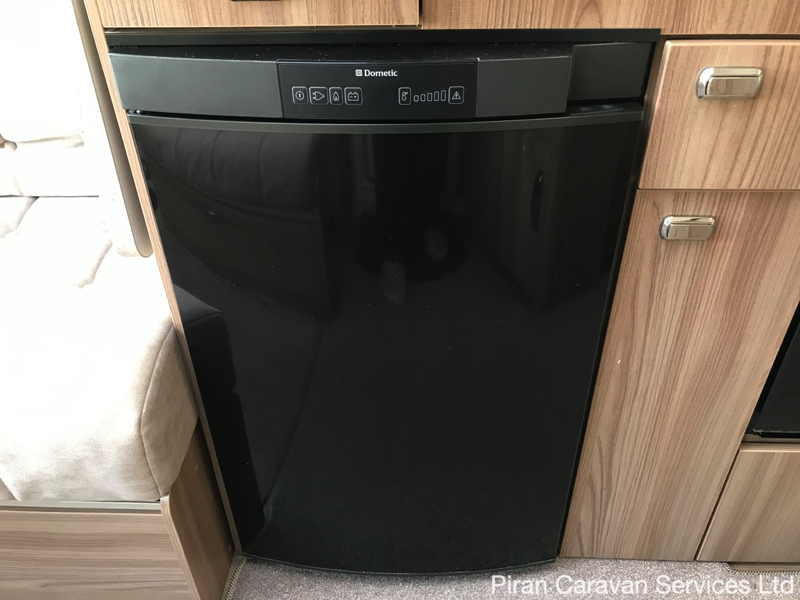 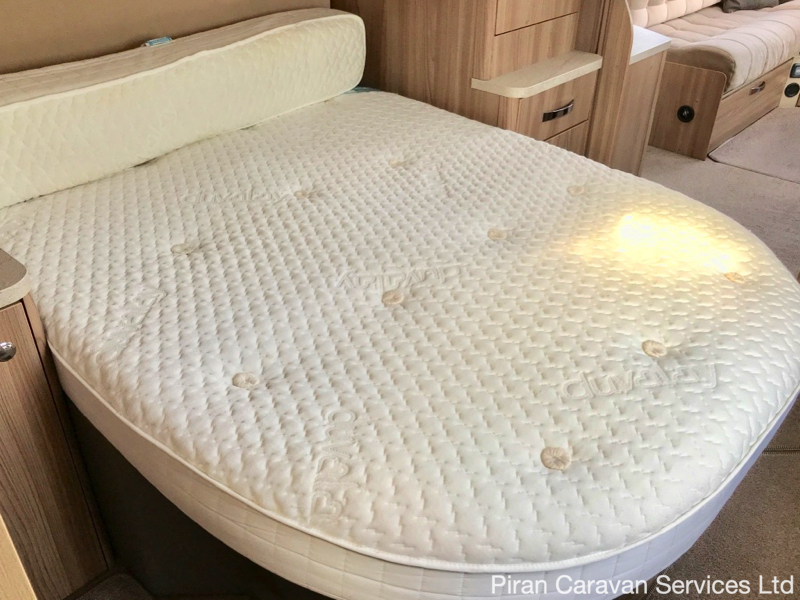 Offering fantastic value for money, this caravan provides peace of mind thanks to it having been fully serviced and dampchecked. 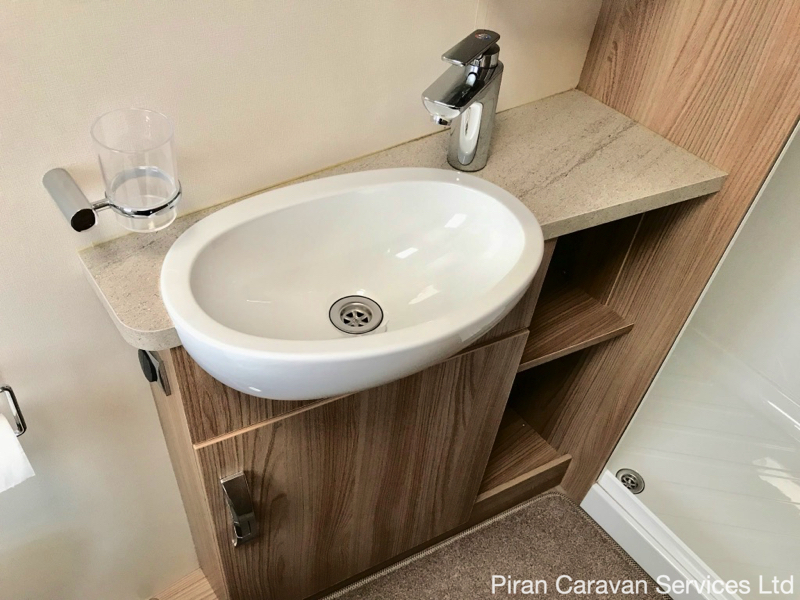 Being sold with all of the extras needed to start caravanning, this Swift Evolution 584 is just waiting for it’s next owner to hitch up and enjoy a modern, spacious and luxurious caravanning holiday. Please call us now for more details or to book a viewing.